It’s June and you know what that means, Go Go’ers. We’re hitting the straightaway on the speedway of fun. This weekend, you’ll want to accelerate. Mourning the end of the Pacific Standard Time ARTravaganza? Put away that hankie and put on your trainers. Made in L.A. 2012 opens this weekend courtesy of the Hammer Museum and LA><ART and with three venues and tons of scheduled events, you’ll be art-ified for months. The Hammer’s first large-scale biennial survey of the work of Los Angeles-based artists highlights under-recognized mid-career artists as well as creative up-and-comers. (Your favorite kind of newbie.) 60 artists will be represented in the disciplines of figurative and abstract painting, sculpture, video installation, site- and situation-specific works, photography, works on paper, performances and public programs. Luckily, those are your favorite kinds of art. The art love will be spread around in a geographically desirable way so make sure your GPS is programmed with addresses for the Hammer Museum in Westwood, LA><ART in Culver City, and the Department of Cultural Affairs’ Los Angeles Municipal Art Gallery at Barnsdall Park in Los Feliz. And for multi-taskers, there are thoughtfully scheduled Venice Beach events for your tan time needs. Your artistic sunscreen is standing by. MADE IN L.A. 2012 — Sat, June 2nd @ 11 a.m. at the Hammer Museum and LA><ART; various prices but Wells Fargo credit/debit card holders+ guest get in to the Hammer FREE by showing your card at the desk! Go to http://www.madeinla2012.org for schedule. Swing your partner over to the Echo 6/2. You flew the coop in January and were otherwise occupied (ahem) on March 17th. Naturally, you’re jonesing for some summer time promenade and allemande right. 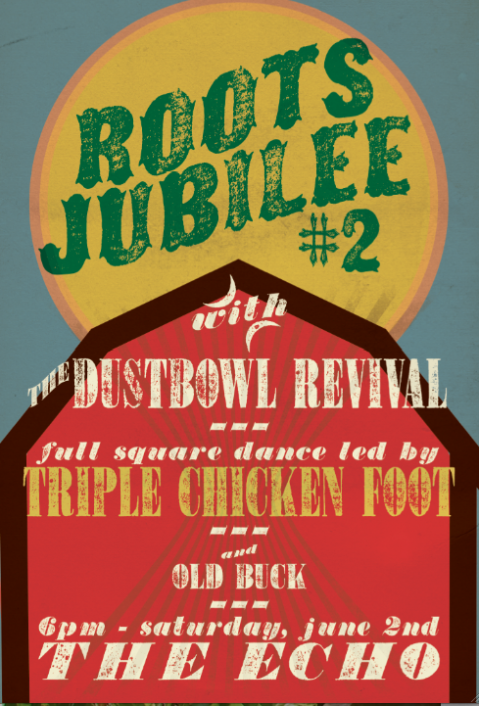 The good folks at the Echo are giving you a helping hand (and a swing your partner) this Saturday, June 2nd, with the Roots Jubilee #2 square dance and night o’ roots music. The all ages event is early start/early end so you can kick up your heels and still get the kiddies home for bed. Or yourself into a dark, cozy booth with a cocktail or three…. Roots rovers Old Buck anchor the porch, the stomp-fiddle drive of Triple Chicken Foot and their pro square dance caller keep your hands and feet flying, and the hard-charging, Depression-era dance music of The Dustbowl Revival keeps the party going. Hint: In a square dance, Ladies Chain isn’t what it sounds like. ROOTS JUBILEE #2 –– Sat, June 2nd, 5-10pm; $8/All ages – The Echo, 1822 Sunset Blvd, Echo Park, 90026; RSVP here. Info here. Departing with de LaB for design and dim sum 6/3. Ms. Go Go SO drinks to that triple whammy of “tions”. Case in point: de LaB’s annual Design-n-Dim Sum Bike Ride this Sunday, June 3rd. You’ll meet-and-seat at Flying Pigeon LA bike shop at 11am (Bikes available for rent on a first come, first served RSVP basis), then wheel off at 11:30 a.m. for visits to the Eastside studios of architectural design firm Preen, Inc., which did the much-touted design for Aidan Demarest’s NEAT bar, and photographer Zoe Crosher who was recently honored with LACMA’s Art Here And Now award. And if you’re one of the 5 million+ interwebbers who viewed 9-year-old Caine Monroy‘s hand-built arcade in his father’s auto parts shop, you’ll want to bring some dollar bills; de LaB will be stopping by to play at the pint-sized designer/entrepreneur’s establishment. Hint: you get 500 turns with the $2 “fun pass”. Your final stop is in Chinatown for cash-only ($20 recommended) dim sum at Golden Dragon. Hint: they probably won’t accept fun passes. 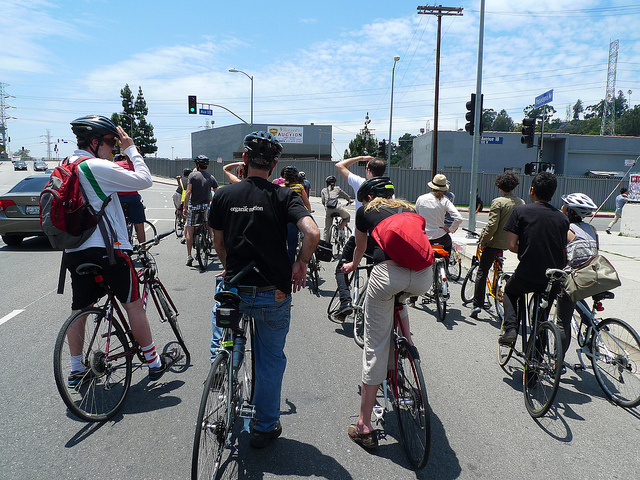 de LaB DESIGN-N-DIM SUM BIKE TOUR — Sun, June 3, 11am-3pm. Tour is FREE; bring money for arcade, dim sum ($20), and $15 IF renting a Flying Pigeon LA bike (first come, first serve basis via RSVP) — Flying Pigeon LA (NOTE NEW ADDRESS! ), 3404 N. Figueroa St. LA, 90042, 213.909.8986, info@flyingpigeon-la.com Click for itinerary/artists info.